As promised - I'm breaking down some of my favorite weekday dinners! Some nights I like to throw everything on a sheet pan and call it good! Other nights I like to get Kennedy involved and measure out 5+ seasonings! Every day is a little different in the Callahan household - I like to think we just keep it interesting! Our meals usually consist of a protein, veggie, and a 2nd veggie or a fruit! This is one way how we find balance in our day-to-day crazy. 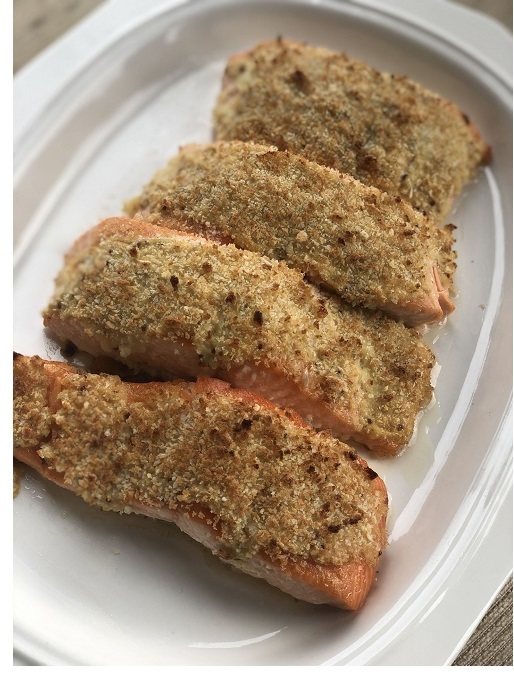 Below you'll find some links to some of my favorite go-to weeknight dinner options as well as my very own E-A-S-Y Honey Mustard Crusted Salmon. Spray a baking sheet with spray avocado oil. Place salmon fillets on the baking sheet. Pour Bolthouse Farms Honey Mustard dressing over the top of each salmon fillet. Top with panko bread crumbs and place in oven for 10-15 minutes depending on how well done you prefer your salmon. Place your oven on broil—and watch fillets until you see the panko turn light brown. It typically takes mine about 5 minutes!